May is here!! As many of you know the infamous Brangelina are engaged. In case you haven’t seen the oh…um….250K ring yet well here you go! 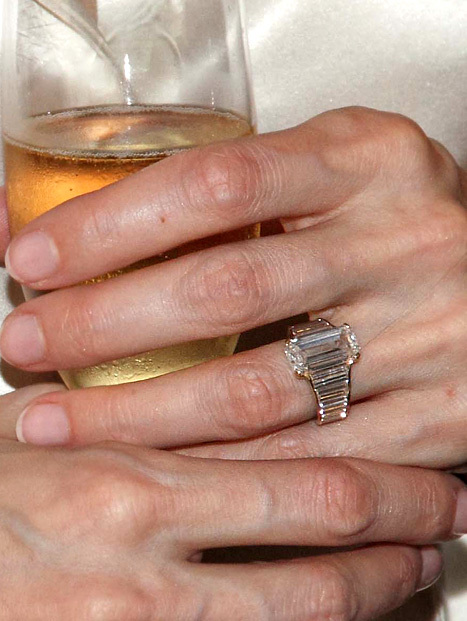 Angelina Jolie is now walking around with this emerald cut rock on her left hand. Engagement Ring Designer: Robert Procop. According to Procop, Brad’s inspiration for the ring was to embody Angelina’s style and grace. And just for fun, here is the trailer from the upcoming movie 5 Year Engagement. Rather appropriate for a marriage proposal blog. Do you plan to see the movie? For all those of you who had long engagements, what is your take? !